You are browsing the Blog for LED color. You may be familiar with the idea of a color gamut from displays or from RGB LED fixtures. 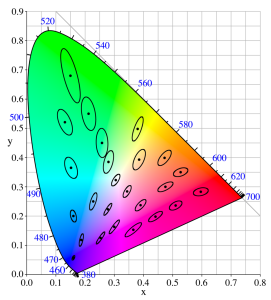 In both cases the gamut describes the full range of colors that the device can create. In TM-30-15 IES Method for Evaluating Light Source Color Rendition gamut (Rg) has a somewhat different meaning. It refers to the average color shift of the 99 color evaluation samples (CES) under the test light source when compared to the reference light source. The reference source used in Rg is the same source used when calculating color fidelity (Rf) (as opposed to a fixed reference source as has been proposed in other gamut metrics). 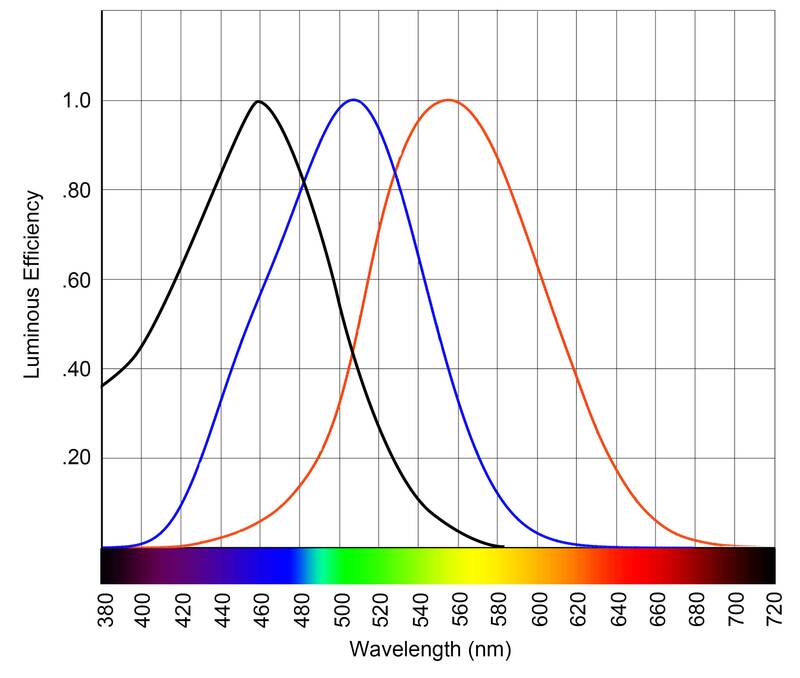 A gamut index of 100 means that, on average, the test light source doesn’t change the hue or saturation of the CES compared to the reference source. An Rg above 100 indicates that the test light source, on average, increases the saturation of the CES producing colors that are more vivid. 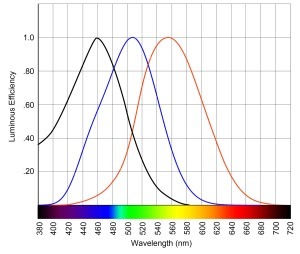 An Rg below 100 indicates that the test light source decreases the saturation of the CES producing colors that are less saturated. The addition of a gamut index is a huge improvement over the single CRI (Ra) number that we’re used to. With Ra, every shift from a match to the reference source, whether it increases or decreases saturation, is treated equally and the direction of the shift is not reported. However, this is important information. For instance, research has shown that in many situations most people prefer a slight increase in color saturation. With Rg designers know the direction of the color shift, and the TM-30 calculation tool also shows the shift by hue and for each of the CES. What’s the relationship between Rf and Rg? If Rf is 100 (a match to the reference source) Rg must also be 100. If the Rf calculation doesn’t indicate a mismatch with the reference source then there is no change in saturation. As the Rf value falls the potential range of Rg above and below 100 (indicating an increase or a decrease in saturation) grows. The calculation tool includes a chart that shows this relationship and gives a visual indication of where the light source in question fits. Another graphic, the Color Distortion Icon, is plotted on the CAM02-UCS color space. In this graphic both the reference source and the test source are shown, along with an indication of the direction and magnitude of the hue shift caused by the test source. Finally, we can even look at the color shift for each of the 99 CES. A designer using TM-30 now has three big picture metrics to evaluate a light source: color fidelity (Rf), color gamut (Rg), and correleated color temperature (CCT). The designer can use TM-30’s calculation tool to examine the Rf and Rg of a light souce in as much detail as the project merits, from a very broad overview to a very detailed, color by color, evaluation. The one thing that TM-30 does not do is provide guidance on the significance of the values it calculates. It is a Technical Memorandum that describes two calculation proceedures, not a design guide for using the results of those proceedures. Guidance will come later in the form of a TM-30 addenda or a design guide prepared by the IES, or guides prepared by other parties. In the meantime designers can begin to build their own understanding by comparing Rf and Rg values to the their visual evaluation of the light source, and by sharing the results of their work with others. The pubication date has not been set, but now that the TM has been approved by the IES board of directors it should be available soon. Keep an eye on the IES bookstore and on trade publications for updates. In my opinion TM-30 is a huge improvement over CRI, and I hope that the industry enthusiastically adopts it. Note: This post was originally published on June 15, 2015 but was taken down when the IES contacted me and claimed copyright to all graphics produced by the TM-30 calculation tool. This seems to me as absurd as Adobe claiming copyright to all pictures edited in Photoshop, but I didn’t have the time to argue. I took down the original post and have reposted it here, without graphics, and edited the text to omit references to graphics. I’ve been hired to review an architect’s lighting design and then design an appropriate control system. The fixtures selected are all LED products by a manufacturer that falls into the high-end residential/economy commercial range of quality and price. The cut sheets are extremely frustrating. After nearly a decade of LED lighting, and with all of the progress the industry has made in setting standards so that designers and specifiers know what they’re getting, this manufacturer still tells us nothing. What basic information is missing? Lamp life. The only information even remotely connected to lamp life is the statement that the fixture is covered under a five-year warranty. There’s nothing else. Not a word. How much light, compared to initial output, can we expect at that five-year mark? We have no idea. LEDs do not fail like other lamps do. They gradually dim as they age. At what point is the light output so low that we’d say the lamp is no longer useful? Right now the answer is when the light output has fallen to 70% of the initial output (often referred to as L70), although many designers prefer to use 80% of initial output (referred to as L80). This is calculated using a procedure developed by the IES and designated as LM-80 (details are here and here). What we want, at a minimum, is the IES LM-80 calculation of lamp life to 70% of initial output. L80 data would be even better. Warranty. The warranty is not on the manufacturer’s web site so, although we’re told that it is good for five years, we have no information about what is covered and what is excluded. LED manufacturer. With all other lamp types the designer chooses the exact lamp for the project. Criteria such as initial lumen output, mean lumen output, lamp life, color temperature, CRI, and the manufacturer’s reputation for quality are all valid considerations. We have standards that allow designers to make valid comparisons between LED products, too, but we can do that only if that information is generated and shared. I suspect that this fixture manufacturer uses LEDs from a several manufacturers based on the best price available, and that the performance of those LEDs varies widely. Color consistency. The cut sheet says that the standard applied to their LED selection is, “minimum 3-step color binning.” We are left to infer that means three-step MacAdam Ellipses. A one-step MacAdam Ellipse describes a region on a chromaticity diagram or color space where the edges of the ellipse represent a just noticeable difference from the color at the center (additional information on MacAdam Ellipses is here and here). The data is usually plotted on the CIE 1931 (x, y) chromaticity diagram. The diagram below shows 10-step MacAdam Ellipses. The color variation within a three-step ellipse would be noticeable to over 99% of the population. Worse, though, is that a three-step ellipse is the minimum, not the maximum. Knowing this, the designer should have no expectation of color consistency from one fixture to another. Photometrics. The cut sheet contains no information about the optical performance of the fixture. IES files are available, but it’s very difficult to look at the array of numbers and understand performance, which is why the good manufacturers include photometric information on their documentation, including candlepower distribution curves and CU tables. Part of my review will be pointing out the lack of data about the specified fixtures and recommending several alternates by manufacturers who provide the information necessary to evaluate their products. A recent article in The Wall Street Journal discussed the possibilities and benefits of lighting systems that shift color to mimic the changes in daylight. It’s a complicated subject so it’s not surprising that some of what’s reported is inaccurate, so let me clarify a few things. The ipRGCs signal to the SCN, which keeps our circadian rhythms are kept in sync with the day/night cycle, seems to be affected by three factors: color balance; intensity; timing. Cool (bluish) light should be delivered at a relatively high brightness in the morning hours. Delivering cool light in the evening hours can disrupt sleep and other processes controlled by the SCN. Next, there’s nothing special about LED lighting that makes it uniquely appropriate for this application. Fluorescent, HID, and incandescent light (adjusted with color filters) can all be used to create a system that delivers cool light in the morning and warm light in the evening. In all cases, this involves the use of light sources of several tints (warm, cool, and possibly neutral) that are individually controlled. The WSJ is completely wrong when it says “unlike incandescent or fluorescent lights, LED lights’ materials and electronic components allow for finer adjustments of color, brightness and intensity.” A single LED creates light of a single color. To shift colors a second LED is required. Brightness and intensity are the same thing. With LEDs set to surpass sales of all other light sources within the next several years, research involving sources other than LED is nearly non-existent. Naturally, researchers are using LEDs to test theories and to develop demonstrations and products. Finally, it would be helpful if the WSJ had defined two terms – color temperature and CRI (Color Rendering Index). Both are explained in Chapter 8. Color rendering and CRI are briefly explained in this post. CRI and color temperature are both addressed in this post. Today I was at an LED “shootout” at the New York City office of Barbizon (special thanks to John Gebbe and Scott Hali). We were looking at products that might be used in a specific application – that of lighting an auditorium or theatre. The shootout was between 26 fixtures from 17 manufacturers, all installed at a height of 10′. Architecturally, the designer is essentially lighting three conjoined rooms: the orchestra, where the ceiling can be 35′ high or more; the balcony, where the ceiling can range from 12′ to 25′ because of the steep slope of the seating; under the balcony, where the ceiling may range from 12′ to 18′, again because of the slope of the seating. The first part of the challenge is to find a set of fixtures that can provide even illumination in these three spaces, each one of which has a sloped floor and therefore a varying throw distance. The second part of the challenge is for all of the fixtures to dim simultaneously. Unfortunately, I don’t think we saw success. Here’s what we saw. First, only one manufacturer had a product line for all three possible mounting conditions – pendant, surface, and recessed. That manufacturer, though, didn’t have three beam spread and/or brightness options to meet the range of typical installation heights. Second, LED manufacturing is maturing, but it’s not mature. That means we still don’t have strong, industry-wide standards for things like color. In many cases it was difficult to use fixtures from two or more manufacturers because the color of the light produced (visually evaluated, and measured in color temperature, peak wavelength and spectral content) clearly didn’t match. Finally, getting fixtures from multiple manufacturers to dim simultaneously proved very difficult. Each set of installed fixtures would need its own (perhaps custom) dimming curve just to get a close match, and identical performance seemed impossible. The problem here is three-fold. First, multiple control protocols would be required. The fixtures demonstrated used line voltage dimming, three-wire dimming, 0-10v DC, and DMX protocols. That’s not a deal breaker, but it is an unfortunate complication. Second, some of the LED drivers produced unacceptable dips, flickering, or pulsing of the light as they dimmed. Third, some of the LED drivers couldn’t make a smooth transition from darkness or light, or light to darkness. We saw fixtures pop on and drop out, dim up nicely but not dim out well, and dim out well but pop on. Eventually this might be as easy as working with incandescent lamps, but not yet. The easy lesson was that, for now, the safest choice for smooth dimming from darkness to full light is still incandescent. The color of the light from fixtures in all of the installation conditions will match, the dimming curves will be the same, and they’re easy to dim. The complicated lesson was that it is absolutely essential to mock up the proposed lighting system, using the LEDs, drivers, control protocols, and dimming equipment that will be installed. It’s the only way to be certain that the start and end of a show, when the house lights dim down and then back up, isn’t a light show of its own.